Install a reliable AV suite, then disable Windows Defender. Problem solved. Hint: I said "reliable AV Suite". That excludes AVs with a standing history on false positives like Zemana and Norton -or- spammer data suppliers like Avira and its GData clone. That's a known issue in the downloads - they have no code signature currently. See issue #152, and feel free to post a link to a cheap code signer if you have one. This is a known issue with downloaded files that have not been signed, such as with downloaded Excel files. To remove the error/restrictions before running the executable, you have to "Unblock" the downloaded executable. Otherwise click "Run anyway" to accomplish the same process below. 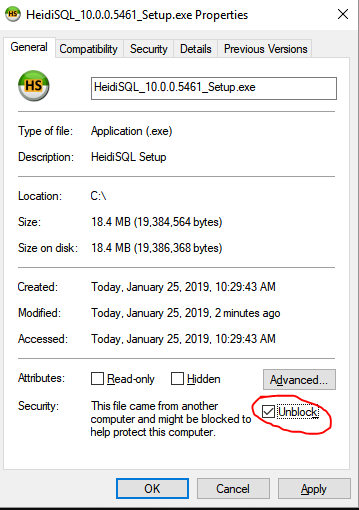 In the Dialog, check "Unblock"
For everyone's info... this issues doesn't happen with every update of heidisql but with some which makes me doubt if the missing signature is the issue.